Going to the beach can be a fun day in the sun, but you do have to worry about the security of the items you bring with you. Leaving things in the locked trunk of your car is probably your safest bet, but you’re going to want to have your phone, wallet, and keys with you (the latter is a must for obvious reasons). If you haven’t found a good way of dealing with this issue just yet, then you’ll be happy to know that there are a myriad of options available. One of these is the Beachsafe. It may look like it would only function as a backpack, but is also a security system, chair, and can be weighted to prevent theft. On the outside, it looks like a regular ole beach bag, and is capable of holding toys, towels, bottles of water and more. 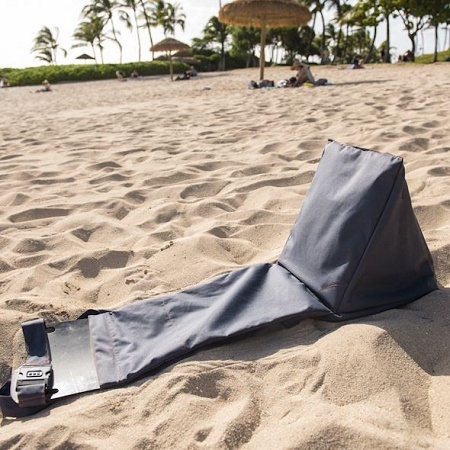 Once you find a good spot on the beach, you can unfold the pack, fill the bottom section with sand or stones, put your valuables in a hidden compartment, and relax. There’s a hard plastic aspect to the opening where you would put in whatever you’re going to weigh your bag down with, meaning you can use it as a shovel. Once you have everything in place, you can make sure all your valuables are secure by setting the coded lock. No one is going to be able to run away with a locked bag that weighs a hefty amount without at least being noticed by others. This will cost you around $76, but may not be very useful until next year as we’re already headed toward colder weather.